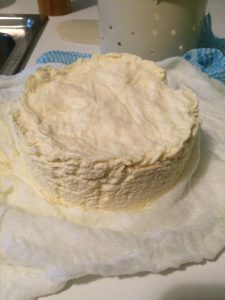 Welcome to Part 2 of Poopsie’s cheese making post. We hope you like it! So with a weekend to myself, I figured it was time to make a second batch of Feta. I finished reading the books, so I knew the theory, and after the first batch I also knew what not to do! Back in the day, I used to home brew my own beer and sanitising was the worst part of the whole affair. I’m pleased to say that it is a lot simpler when making cheese than it is with 48 long neck bottles. I boiled the kettle and poured it all over anything that I was using for the cheese (pan, spoon, thermometer and measuring cup) then left it all to dry. 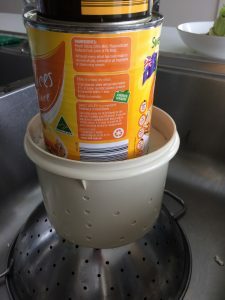 I took 4 litres of milk and put it into my largest pan (which just so happened to hold 4 litres) and set it on a low heat to get up to 30°C. Because I was using store bought milk, I added 1/4 teaspoon of calcium chloride. While that was warming I diluted 1/4 teaspoon of lipase (the stuff that gives the cheese it’s feta-riness) and stirred it through. 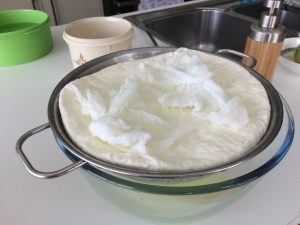 Once it was at temp, I sprinkled in a dose of Mesophilic culture, waited a minute or so for it to bloom (or rehydrate for you non-cheesemakers), then stirred it in and put the lid on – I then left it for one hour. During that time, I filled the wheelie bin up with tree prunings that have been lying in the backyard for 4 weeks. But I digress. Then it was lid on again for another hour. During this break I thought I’d make a cheese mold out of an old tupperware container I’d ‘obtained’ from my mother in law. Do you think I can still claim it on the lifetime warranty? This basically involved me going to town with the drill and knife to create enough holes for the whey to drain away. 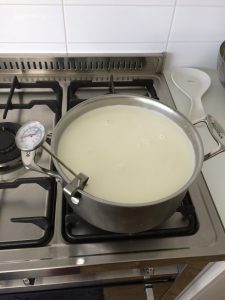 The next bit is my favourite…You basically have 4 litres of hard milk, and once you’ve checked for a clean break (stick your knife in and see if it tears cleanly rather than mushy), I used my cake palette knife to cut the curds into squares. It was sooooo satisfying. Another half an hour to wait (I hit YouTube during this break- is Snook Darth Maul? I just don’t know). You’ll notice a yellowy liquid seeping around, which is very evident during the next step of stirring the curds for 20 mins (I did it for 5 before losing interest, and to see what would happen…), then, you guessed it, another 30 minute wait. DO move anything out of the way that will be harmed by luke warm curds splashing all over it. DO make sure you have dry hands and that you have a good handle on the pan. DO make sure your colander is big enough. DON’T try and pour faster to get it over and done with…you’ve been warned, I made these mistakes, so you don’t have to. Looks gross, hopefully tastes great. Then it’s time to…*All together* – Wait another 30 mins. 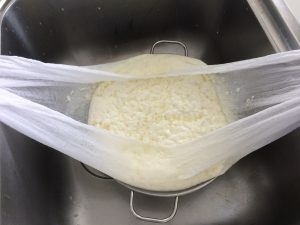 I only have one cheesecloth, so I transferred the curds to a bowl, then put the cloth in the mold and spooned it back into the cloth. As you can see in the picture, I had two sizeable cans in the cupboard to weigh it down. Now the recipe suggests two hours under pressure, then into brine (salty water), but one of the issues after the first batch was that it was too wet, and because I’m a bit of a know it all, I figured if 2 hours is good, then 6 hours is better. So that’s how long I left it in the mold. 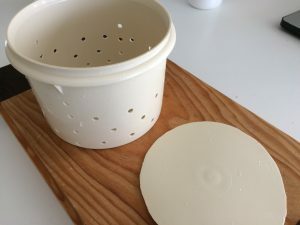 All that’s left to do is make a simple brine (warm water, a heap of salt, a splash of vinegar and some calcium chloride), de-mold the cheese and pop it into the brine in the fridge for a day, flip it and leave it for another two days, and it’s ready to eat. All in all, a time consuming, messy (surprisingly smelly), but thoroughly enjoyable process, which got me about a kilo of rather nice feta cheese. The milk cost $4, the cheese making supplies around $40 (but that is enough to make ~25 kgs) so it’s reasonably cost effective. But it’s more about the process and the accomplishment than anything else (and the superior feeling whilst serving it to friends and telling them I made it). What have you prepared just because you’ve always wanted to, let me know below? Impressive! Makes you cringe at how much they charge us for feta at the supermarket, doesn’t it? Those profit margins must be huge. True although the deli at Coles/Woolies often reduce their feta to 50% off! Definitely grab it when they do! This post made me laugh! I didn’t realise that cheese making was so time consuming had so many convenient inbuilt breaks. You can make cheese and keep up with life on the Interwebs. Lol yes, Mrs ETT, Poopsie manages to fit many other things around his cheese making! I had no idea the amount of work that goes into making cheese. I’m so use to picking it up at the market that I never think about the process behind it. Thanks for sharing. My wife and I will definitely need to try this out sometime. Thanks for stopping by Mustard Seed Money. Come back and let us know if/when you try making some cheese yourself!